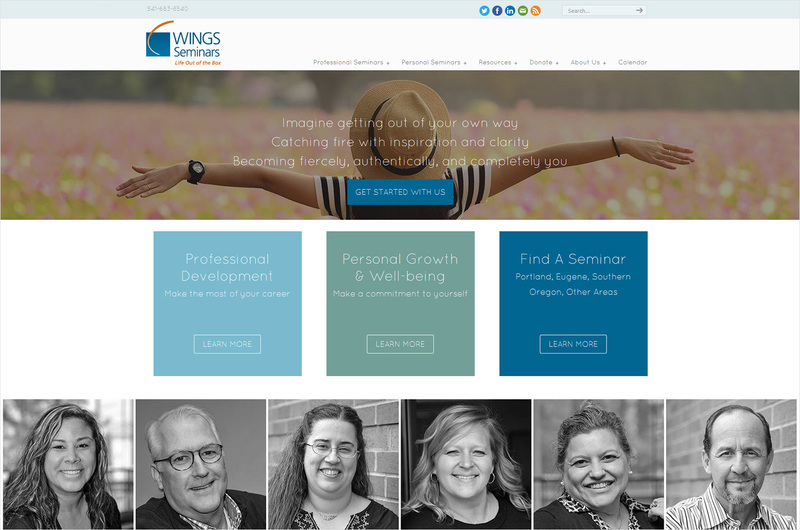 What an honor to collaborate with the incredible team at Wings Seminars! Since 1986, more than 35,000 people have attended their personal and professional development seminars—to connect with their inner wisdom and achieve the meaningful lives they’ve always wanted. Based in Eugene Oregon, Wings is renown for its life-altering seminars. The testimonials say it all, and at the heart is profound transformation. Wings approached Ruby Slipper with the task to re-design the home page, and most importantly, feature the two paths: Professional Development and Personal Growth. They wanted to explain their offerings to both newcomers interested in the program, connect with and highlight the thousands of graduates from throughout the years, and showcase their locations. Working with the talented Wings team—Sherrie, Program Director, Zach, Webmaster, and Julie, Communications Officer at La Clinica—we constructed the careful balance of messages, colors, photography, calls to action, and content arrangement. The end product is light yet substantial, with depth and clarity.